Bacteria are no different. Some bacteria know how to defend themselves. Researchers at the University of Vienna have discovered a species of bacteria called Amoebopohilus which use self defense weapons to survive in hostile conditions inside amoebae. Scientists from ETH Zurich document the incredible act of survival. Amoeba are predators; they use special pseudopodia to hunt bacteria. Once they grab hold, the amoebas absorb and digest the bacteria. When amoebas attempt to digest the Amoebopohilus bacteria, the bacteria fight back using special gun-like devices. These gun-like devices shoot micro daggers and damage the amoeba from within. The bacteria use self defense micro-daggers to pierce the inside of the amoeba to protect against absolute digestion. Amoebopohilus’ self defense tactics allow their kind to thrive in the most hostile conditions. Now these bacteria prefer to live inside amoebae. The bacterium’s self defense mechanism includes a spring-loaded sheath attached to an inner membrane. Locked and loaded, this sheath is ready to contract and shoot micro-daggers when the bacteria’s life is threatened. The bacteria shoot the micro-daggers into the amoeba’s important digestive compartment, bursting it open. This allows it to escape and take up residence elsewhere inside the amoeba. The bacteria can then multiply inside, thriving in hostile conditions. The researchers believe that the micro-daggers are “impregnated with a kind of arrow poison” which destroys the amoeba membrane using enzymes. The bacteria’s genome contains the blueprints for those self defense enzymes. The scientists determined the three dimensional structure of the daggers and their shooting mechanisms by freezing the amoebae and the absorbed bacteria to minus 180 degree Celsius. From there, they used an ion beam to chisel away the specimens. Finally, they isolated the molecular daggers and their shooting devices, producing a three dimensional electron tomogram. The final resolution shows fine details, including the base plate and anchor that holds the spring-loaded sheath. The scientists discovered that the micro-daggers were clustered in groups of up to 30 rounds. “You could call them multi-barrel guns,” Pilhofer said. 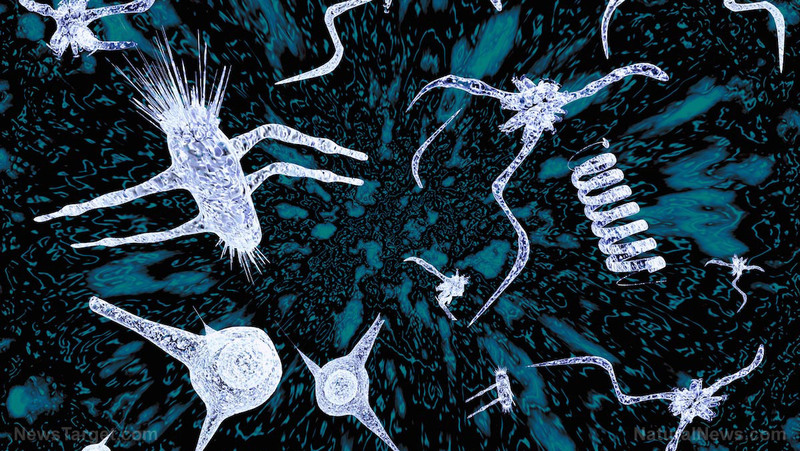 When their genome was compared to other species of bacteria, the scientists confirmed that at least nine other bacterial groups possess similar self defense mechanisms. Even though we hope and pray for a world of non-violence, violence is all around us. Sometimes evil confronts us and we have no choice but to defend everything that is sacred to us. In the same way these bacteria are ready to protect themselves from vicious amoeba, we too must be vigilant and ready to defend our lives if need be. Self defense is a human right and this right is reflected throughout nature. Stay up-to-date with the latest ideas in self-defense at Preparedness.News.